In a post dated December 2, 2009 we announced with some chagrin, our White Cloud Mountain minnows had gone off the grid and gifted us with fry. If you would like to start at the beginning, the date above will take you to that post, a link at the end will bring you here again. The fry remained in that bowl for 10 days, until other arrangements could be made and we were sure they were viable. The plan was to take the large one out of the bowl, put him in the nursery tank and leave the mid-size group as well as the smaller size group in the bowl for a bit longer. It proved too difficult to “spoon” him out of the holding bowl. 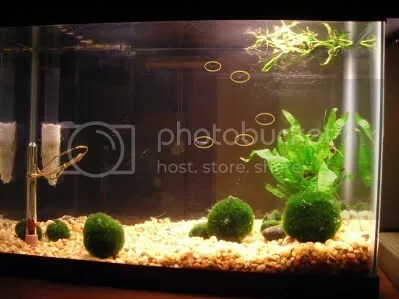 A prayer was said, the whole bowl, fry, marimo balls, and detritus were dumped into the 5g tank. The shot here of the largest White Cloud Mountain minnow fry indicates he is 1/2″ but in fact he is 5/8″ as of yesterday. He is twice the size of the mid-size group of fry. tank mates, none the worse for a little documentation. 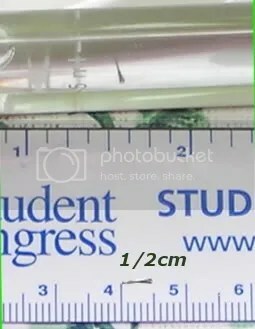 The smallest group are about 1/5 cm long. We lost one for sure, saw the carcass floating. When I looked back to retrieve it, I could not find it. I would not be surprised if the largest has made a meal or two of the weaker ones. Nice to hear Google is picking up one of the blogs on a pretty regular basis. Thanks for the feedback, we are glad to have you aboard.